Drew Barrymore was born in Culver City, Calif., into a revered acting family that includes, among many others, her grandfather John Barrymore. She started performing in commercials before her first birthday. At age 6, she was chosen by director Steven Spielberg to co-star as Gertie in E.T. : The Extraterrestrial. In 1995 she created her own production company, Flower Films, with partner Nancy Juvonen. Their first film was the 1999 comedy Never Been Kissed, followed by the box office hit Charlie's Angels in 2000. Firmly established as a production powerhouse, Flower Films subsequently produced the features 50 First Dates, cult favorite Donnie Darko, Duplex, Charlie's Angels: Full Throttle, Music and Lyrics, Fever Pitch, He's Just Not That Into You, and Whip It, which Barrymore appeared in and directed. Barrymore won a 2009 Golden Globe Award and Screen Actors Guild Award for her role as fallen heiress Edith Bouvier Beale in the lauded HBO production of Grey Gardens. Currently, she stars in and executive produces the Netflix original series Santa Clarita Diet, which recently wrapped production on Season 3. Barrymore's birthday is Feb. 22. 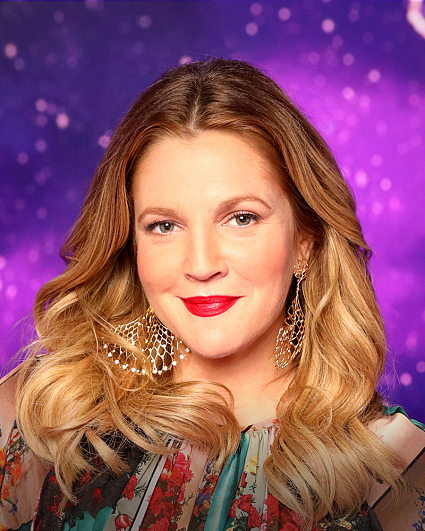 Follow her on Twitter @DrewBarrymore and Instagram @drewbarrymore.